Meters & Instruments Corporation has released the AQ1200E, AQ1205A, AQ1205E, and AQ1205F multi field testers. These are new additions to the AQ1200 OTDR series of multi field testers, which are used to test the physical condition of fiber-optic telecommunications networks. Featuring high performance and easy handling, our AQ1200 OTDR series multi field testers are compact, lightweight, and moderately-priced, with all the functions needed in the field. Among the new models announced today, the AQ1200E, AQ1205E, and AQ1205F each support three different wavelengths, so that even a single unit can cover installation and maintenance work for an entire access network (a network between the station and subscribers). The AQ1205A, AQ1205E, and AQ1205F also feature a wide dynamic range and enhanced waveform quality, ensuring accurate measurements with fiber-optic communication networks that have a large-port-count optical splitting device with a high insertion loss. To respond to the growing volume of video and other types of data transmitted over networks, high-speed and large-capacity fiber-optic telecommunications networks are being installed all over the world. There is strong demand for OTDRs in emerging countries like China and India that are rapidly expanding their fiber-optic networks. In countries such as Japan and South Korea where the fiber-optic communication infrastructure is already well established, OTDRs are also increasingly in demand for maintenance work that will ensure communication quality and stable operation. Yokogawa also offers a high performance OTDR fiber-optic tester, the AQ7275. This versatile high-end model can be used in the installation and maintenance of trunk lines that connect large cities to access networks. However, for operations that mainly involve the field maintenance of access networks, a smaller and lighter measuring instrument is needed. 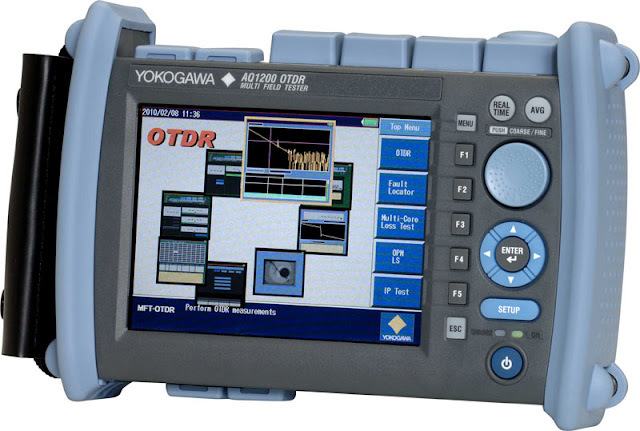 To satisfy this need, Yokogawa released the compact, lightweight, and moderately-priced AQ1200 OTDR series in February 2010. Each of the initial three models in this series has a different measuring wavelength and dynamic range. All AQ1200 OTDR series multi field testers are compact (A5 size), lightweight (approximately 1 kg), and come with various essential functions for the field maintenance of fiber-optic communication networks. They are just half the size and one-third the weight of the AQ7275. These testers all support passive optical network (PON) systems that branch out optical fibers from stations using an optical splitter and connect them to multiple subscribers. With PON systems, a measurement waveform tends to deform due to the attenuation of optical signals at a splitter. The AQ1200 OTDR series multi field testers can determine whether any problem is caused by a line failure or signal attenuation, and can accurately pinpoint failure locations, if any. The AQ1200E, AQ1205E, and AQ1205F models each support two wavelengths for the installation of telecommunication networks and another wavelength for maintenance. Thus, each of these testers can cover both installation and maintenance of an access network. These testers also have a filter in their optical port that blocks the communications wavelength so that it does not disturb measurements made with the maintenance wavelength. This means that even if OTDR measurement is being performed on a network while it is in use, the maintenance work will not affect communication quality and the network operation will not influence the measurement accuracy. The AQ1205A, AQ1205E, and AQ1205F have a wide dynamic range and enhanced waveform quality, enabling accurate measurements even with PON systems that have a large port count splitter.